Vitamin C (ascorbic acid) is required for the synthesis of collagen and to enable WBC phagocytosis, among others. It also serves as an antioxidant, protecting the body from oxidant carcinogens. It is found especially in fresh fruits and vegetables, but is labile, and deteriorates with storage. We will measure vitamin C first in pure solution (to standardize the assay reagents), then in fruit juice. Finally, as a means of evaluating the amount of vitamin C you are taking in, we will measure the quantity you excrete in one hour in your urine. We will assay vitamin C by using a “starch-iodine” titration. When iodine is added to a starch solution, it reacts to produce a purple color. However, if there is any vitamin C in the solution, it “neutralizes” the iodine, preventing the formation of the purple color. Thus, the amount of vitamin C present in a solution may be measured by first adding a small amount of acidified starch (called “reaction mix”), and then adding iodine drop wise until the solution turns purple. The amount of vitamin C present will be proportional to the amount of iodine required to turn the solution purple. This drop wise addition of a reagent to a specified endpoint is called a titration. The solutions required to perform the assay for vitamin C are listed below. While they will be available for you in the lab, you should know the function of each of the ingredients in the titration, and how to make up the solutions if needed. 1) Reaction Mix: a dilute solution of starch which is slightly acidified to stabilize the color. 2) 0.1 N Iodine : the stock solution of iodine which must be diluted before using for titrations. 4) 1.000% vitamin C : a standard solution used to determine the conversion factor of the 0.01 N Iodine. 2. Suspend starch powder in 200 mL dH 2O. Bring to boil with constant stirring, taking care not to burn. 3. Fill a clean 1 gallon jug half full with dH2 O.
b. 200 mL starch solution from step 2.
c. q.s. to 1 gallon with dH2 0, mix thoroughly. 5. Use 10-15 mL of reaction mix (Rxn mix) per titration flask, conveniently added with a repipet. 2. q.s. to 1 liter with dH2 0, keep well capped with iodine-resistant plastic-lined lid. 2. q.s. to 1 gallon with dH2 0, mix thoroughly, keep well capped. 2. Add approximately 50 mL room temperature dH 2 0, swirl to dissolve. 4. Store capped at 4C. Endonucleases are the highly specific enzymes which recognize unique palindromic sequences in DNA at which they hydrolyze the phosphoester linkage. These enzymes have been crucial in the burgeoning fields of genetic sequencing and engineering. Because endonucleases are commonly found on the surface of the skin, as well in bacteria, latex gloves are routinely worn and good sterile technique is required when performing DNA manipulations. The resulting fragments can be used to construct a restriction map of the lambda genome. lambda DNA and rehydrate it when needed. 2. Incubate at least 30 minutes at 37C, an hour might be OK, perhaps needed for double digestion. 3. Halt the reaction by placing on ice, add 6 µL of 6x loading dye, mix with same pipet, reset volume to 25 µL for next step (leave the tip in the Eppendorf tube used for digestion). 4. Load the wells: Pipet 5 µL into one well, reset pipet to 25 µL, pipet that volume into second well. 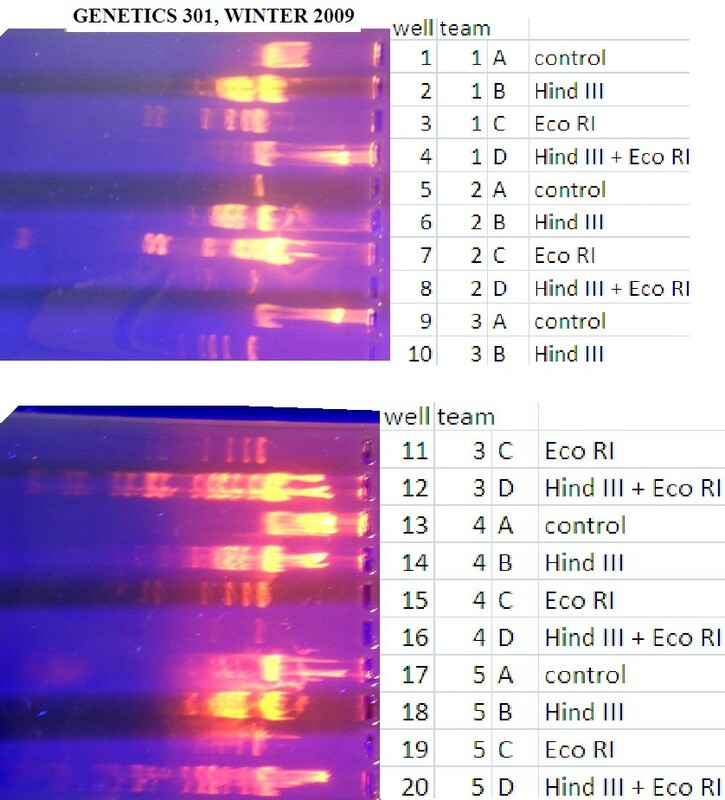 On the same gel, run a lane with 1 ug undigested lambda DNA, and one with 5 ug of a Hind III digest as a standard. Run the gel, photograph or carefully diagram the resulting bands. Here are results of a 2006 experiment to test for optimum quantities of enzyme and optimum quantities of DNA. Below is the gel which we produced Winter Quarter 2005. Problems? Of course… lanes 3 and 12 (BamHI) should be identical. 12 appears to have been contaminated with another endonuclease. Lane 4 shows some double digestion, but may not have been digested long enough. Lane 7 and 13 (EcoRI) should be identical. Lane 7 did not have sufficient endonuclease activity. But, endonuclese activity was demonstrated, and evidence of double digestion developed on all lanes with double enzymes (lanes 4, 9, and 14). Click here to see a similar experiement from 2009. Below are less successful results from 2003. Some browsers resize the image, so be certain that you are referring to the correct lane. Clearly there were several problems. We used two different batches of endonucleases which may explain why digestion was observed in some cases but not in others. The second from the top may be smeared because the last of the enzyme was rinsed out of the tube in order to get the last bit for the digestion. There are eight Hind III fragments: 23,130; 9416; 6557; 4361; 2322; 2027; 564;125 bp long. The 564 band is in the bromphenol blue, and the 125 band appears beyond the dye band. NOTE: Latex gloves should be worn at all times to protect from ethidium bromide, and to prevent contamination of DNA samples with skin-borne endonucleases. 1. Prepare running buffer: Dilute 20 mL 50x TAE buffer to 1 liter in dH2O, mix. 2. Prepare the agar : In 250 mL beaker, weight 0.64 g of DNA grade agarose. Add 80 mL 1x TAE buffer, heat to 95 C over flame with stirring (or in microwave 1 min, swirl, microwave for 15 more seconds). Swirl to ensure complete solution. 3. Let cool to 50C. 4. Meanwhile, prepare the tray: tape the ends of the gel tray with masking tape. Press the tape firmly to ensure a good seal on all surfaces. 5. CAUTION, wear gloves: When cooled to 50 C, a dd 4 µL of 10 mg/L ethidium bromide solution to 80 mL agar to make it 0.5 µg/mL. 7. Place the comb at one end. Gently 9. Remove the comb by wiggling and pulling straight up . Do not tear the agar. 10. Remove the tape from the ends. Set up electrophoresis apparatus: Lie the gel tray with agar in the level electrophoresis apparatus with the wells to the right, towards the black terminals (negative). Fill the apparatus with enough 1x TAE buffer to just cover the gel (filling the wells in the process). Prepare the DNA samples so that they have 1 to 4 µg of DNA in up to 36 µL of solution containing 1x loading dye (i.e. : 5 µL sample plus 1 µL loading dye, or up to 30 µL sample plus 6 µL loading dye.) Mix either by flicking or by drawing up and down in the micropipet. Load 1 µg of undigested, 4 µg of digested DNA. loading the wells Load the samples into the wells by loading the pipet with the desired volume of sample: with braced hands, insert the tip into the mouth of the well without touching the sides or bottom, slowly and steadily depress the plunger without shaking or causing bubbles . When the sample is loaded, withdraw the pipet directly out of the well with a smooth movement. The well should have a layer of blue with no irregularities surrounding it. Place standards (undigested DNA or lambda Hind III digest) in the outer wells. Close the lid, attach the electrodes from the power supply , and turn on the DC power . Set the voltage for 150 volts, and plan to run it for at least an hour , preferably 2 to get the dye 2/3rds across the gel.